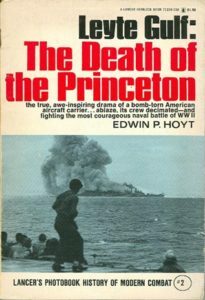 “LEYTE GULF: The DEATH Of The PRINCETON” By Edwin P. Hoyt. The USS Princeton (CVL-23) was a 13,000-ton Independence-class aircraft carrier. On October 20, 1944 Princeton was part of Task Group 38.3, cruising off the island of Luzon. Taking part of the massive Allied invasion of Leyte Gulf, her planes flew against nearby Japanese airfields to prevent attacks on Allied ships. On the the morning of October 24th, the Japanese found the American carrier and shortly before 10:00 a.m. Princeton was attacked. The lone enemy dive bomber dropped a single 500 pound bomb, which struck the carriers’ flight deck. A fire instantly erupted and quickly caused further explosions. The cruiser USS Birmingham (CL-62) came alongside the doomed Princeton to assist. But when the carrier suffered another large internal explosion, 85 men aboard the Birmingham were killed. 108 men from the Princeton were lost in the attack, 10 officers and 98 enlisted men. Another 300 aboard Birmingham were wounded. Here is the entire tragic story of the loss of the USS Princeton. A very rare book, never published in a hardback edition. 1972 Softbound edition, 158 pages, 37 black and white photos, no maps or index.